Attempts to understand the behavior of matter extend back for more than 2500 years. As early as the sixth century BC, Greek philosophers discussed a system in which water was the basis of all things. You may have heard of the Greek postulate that matter consists of four elements: earth, air, fire, and water. 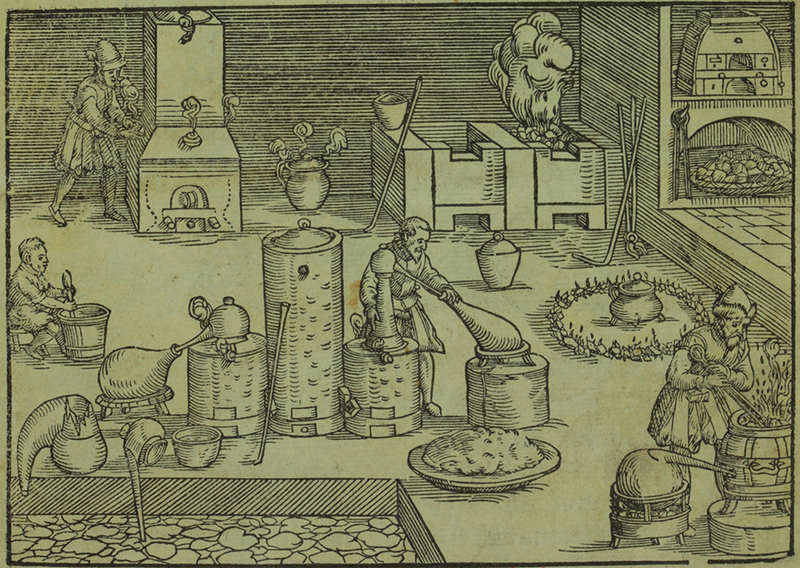 Subsequently, an amalgamation of chemical technologies and philosophical speculations were spread from Egypt, China, and the eastern Mediterranean by alchemists, who endeavored to transform “base metals” such as lead into “noble metals” like gold, and to create elixirs to cure disease and extend life ([link]). Chemistry is sometimes referred to as “the central science” due to its interconnectedness with a vast array of other STEM disciplines (STEM stands for areas of study in the science, technology, engineering, and math fields). Chemistry and the language of chemists play vital roles in biology, medicine, materials science, forensics, environmental science, and many other fields ([link]). The basic principles of physics are essential for understanding many aspects of chemistry, and there is extensive overlap between many subdisciplines within the two fields, such as chemical physics and nuclear chemistry. Mathematics, computer science, and information theory provide important tools that help us calculate, interpret, describe, and generally make sense of the chemical world. Biology and chemistry converge in biochemistry, which is crucial to understanding the many complex factors and processes that keep living organisms (such as us) alive. Chemical engineering, materials science, and nanotechnology combine chemical principles and empirical findings to produce useful substances, ranging from gasoline to fabrics to electronics. Agriculture, food science, veterinary science, and brewing and wine making help provide sustenance in the form of food and drink to the world’s population. Medicine, pharmacology, biotechnology, and botany identify and produce substances that help keep us healthy. Environmental science, geology, oceanography, and atmospheric science incorporate many chemical ideas to help us better understand and protect our physical world. Chemical ideas are used to help understand the universe in astronomy and cosmology. Knowledge of chemistry is central to understanding a wide range of scientific disciplines. This diagram shows just some of the interrelationships between chemistry and other fields. What are some changes in matter that are essential to daily life? Digesting and assimilating food, synthesizing polymers that are used to make clothing, containers, cookware, and credit cards, and refining crude oil into gasoline and other products are just a few examples. As you proceed through this course, you will discover many different examples of changes in the composition and structure of matter, how to classify these changes and how they occurred, their causes, the changes in energy that accompany them, and the principles and laws involved. As you learn about these things, you will be learning chemistry, the study of the composition, properties, and interactions of matter. The practice of chemistry is not limited to chemistry books or laboratories: It happens whenever someone is involved in changes in matter or in conditions that may lead to such changes. Chemistry is a science based on observation and experimentation. Doing chemistry involves attempting to answer questions and explain observations in terms of the laws and theories of chemistry, using procedures that are accepted by the scientific community. There is no single route to answering a question or explaining an observation, but there is an aspect common to every approach: Each uses knowledge based on experiments that can be reproduced to verify the results. Some routes involve a hypothesis, a tentative explanation of observations that acts as a guide for gathering and checking information. We test a hypothesis by experimentation, calculation, and/or comparison with the experiments of others and then refine it as needed. Some hypotheses are attempts to explain the behavior that is summarized in laws. The laws of science summarize a vast number of experimental observations, and describe or predict some facet of the natural world. If such a hypothesis turns out to be capable of explaining a large body of experimental data, it can reach the status of a theory. Scientific theories are well-substantiated, comprehensive, testable explanations of particular aspects of nature. Theories are accepted because they provide satisfactory explanations, but they can be modified if new data become available. The path of discovery that leads from question and observation to law or hypothesis to theory, combined with experimental verification of the hypothesis and any necessary modification of the theory, is called the scientific method ([link]). 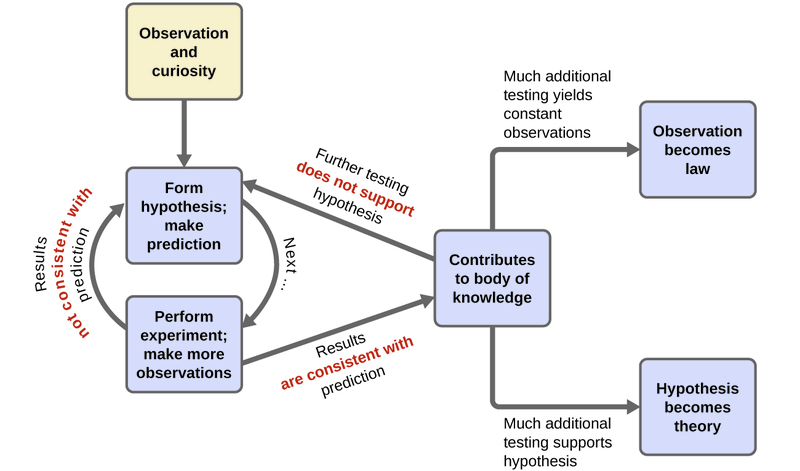 The scientific method follows a process similar to the one shown in this diagram. All the key components are shown, in roughly the right order. Scientific progress is seldom neat and clean: It requires open inquiry and the reworking of questions and ideas in response to findings. Chemists study and describe the behavior of matter and energy in three different domains: macroscopic, microscopic, and symbolic. These domains provide different ways of considering and describing chemical behavior. Macro is a Greek word that means “large.” The macroscopic domain is familiar to us: It is the realm of everyday things that are large enough to be sensed directly by human sight or touch. In daily life, this includes the food you eat and the breeze you feel on your face. The macroscopic domain includes everyday and laboratory chemistry, where we observe and measure physical and chemical properties, or changes such as density, solubility, and flammability. The microscopic domain of chemistry is almost always visited in the imagination. Micro also comes from Greek and means “small.” Some aspects of the microscopic domains are visible through a microscope, such as a magnified image of graphite or bacteria. Viruses, for instance, are too small to be seen with the naked eye, but when we’re suffering from a cold, we’re reminded of how real they are. However, most of the subjects in the microscopic domain of chemistry—such as atoms and molecules—are too small to be seen even with standard microscopes and often must be pictured in the mind. Other components of the microscopic domain include ions and electrons, protons and neutrons, and chemical bonds, each of which is far too small to see. This domain includes the individual metal atoms in a wire, the ions that compose a salt crystal, the changes in individual molecules that result in a color change, the conversion of nutrient molecules into tissue and energy, and the evolution of heat as bonds that hold atoms together are created. The symbolic domain contains the specialized language used to represent components of the macroscopic and microscopic domains. Chemical symbols (such as those used in the periodic table), chemical formulas, and chemical equations are part of the symbolic domain, as are graphs and drawings. We can also consider calculations as part of the symbolic domain. These symbols play an important role in chemistry because they help interpret the behavior of the macroscopic domain in terms of the components of the microscopic domain. One of the challenges for students learning chemistry is recognizing that the same symbols can represent different things in the macroscopic and microscopic domains, and one of the features that makes chemistry fascinating is the use of a domain that must be imagined to explain behavior in a domain that can be observed. A helpful way to understand the three domains is via the essential and ubiquitous substance of water. That water is a liquid at moderate temperatures, will freeze to form a solid at lower temperatures, and boil to form a gas at higher temperatures ([link]) are macroscopic observations. But some properties of water fall into the microscopic domain—what we cannot observe with the naked eye. 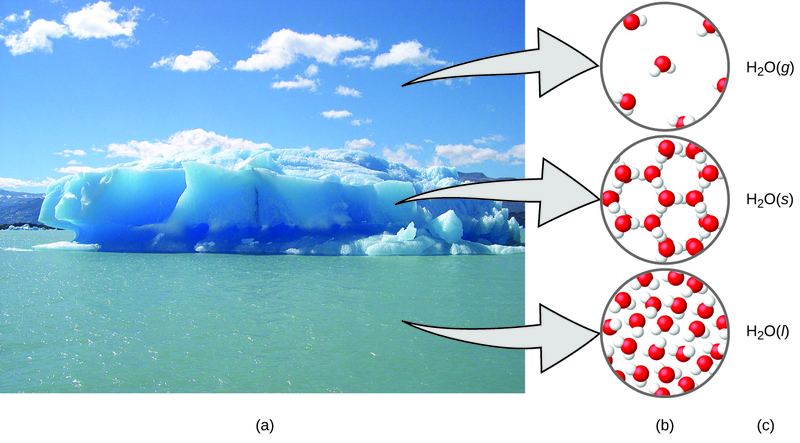 The description of water as comprised of two hydrogen atoms and one oxygen atom, and the explanation of freezing and boiling in terms of attractions between these molecules, is within the microscopic arena. The formula H2O, which can describe water at either the macroscopic or microscopic levels, is an example of the symbolic domain. The abbreviations (g) for gas, (s) for solid, and (l) for liquid are also symbolic. Chemistry deals with the composition, structure, and properties of matter, and the ways by which various forms of matter may be interconverted. Thus, it occupies a central place in the study and practice of science and technology. Chemists use the scientific method to perform experiments, pose hypotheses, and formulate laws and develop theories, so that they can better understand the behavior of the natural world. To do so, they operate in the macroscopic, microscopic, and symbolic domains. Chemists measure, analyze, purify, and synthesize a wide variety of substances that are important to our lives. (a) Falling barometric pressure precedes the onset of bad weather. (b) All life on earth has evolved from a common, primitive organism through the process of natural selection. (c) My truck’s gas mileage has dropped significantly, probably because it’s due for a tune-up. Identify each of the underlined items as a part of either the macroscopic domain, the microscopic domain, or the symbolic domain of chemistry. For any in the symbolic domain, indicate whether they are symbols for a macroscopic or a microscopic feature. (a) The mass of a lead pipe is 14 lb. (b) The mass of a certain chlorine atom is 35 amu. (c) A bottle with a label that reads Al contains aluminum metal. (d) Al is the symbol for an aluminum atom. Identify each of the underlined items as a part of either the macroscopic domain, the microscopic domain, or the symbolic domain of chemistry. For those in the symbolic domain, indicate whether they are symbols for a macroscopic or a microscopic feature. (a) A certain molecule contains one H atom and one Cl atom. (b) Copper wire has a density of about 8 g/cm3. (c) The bottle contains 15 grams of Ni powder. (d) A sulfur molecule is composed of eight sulfur atoms. According to one theory, the pressure of a gas increases as its volume decreases because the molecules in the gas have to move a shorter distance to hit the walls of the container. Does this theory follow a macroscopic or microscopic description of chemical behavior? Explain your answer. The amount of heat required to melt 2 lbs of ice is twice the amount of heat required to melt 1 lb of ice. Is this observation a macroscopic or microscopic description of chemical behavior? Explain your answer. Macroscopic. The heat required is determined from macroscopic properties. Chemistry in Context by OpenStaxCollege is licensed under a Creative Commons Attribution 4.0 International License, except where otherwise noted.